A dauntingly large number of Zope and Python resources are available. The hardest choice is, "Where to begin?" We've whittled it down to the straight and narrow for you. Don't stray from this path until you've reached its end. After that, stray far and wide. You'll know where. Or check out the Additional Resources down below if you'd prefer a series of interesting but endless rabbit holes. Special note: TriZPUG is not a substitute for primary sources. TriZPUG supports Zope and Python education, and is part of the Zope and Python communities, but does not attempt to replace the primary educational materials of the Zope and Python communities writ large. If you are brand spanking new to Python, please see the main Python community help page. Good introduction for students with a little programming experience. The author's website has an excellent ten minute Python overview. See below for two other excellent recommendations. If you are coming to Python as your first programming language, you have made a good choice. There is consensus among many computer scientists: Python may rate as the best choice for learning to program. If you are finding learning how to program is more difficult than you thought, consider this good advice from the Director of Research at Google. While you are waiting for dead tree book delivery, if you have the stamina and the courage, there's always the Official Python Tutorial written by our valiant BDFL. An ocean of Python software awaits you at the Python Package Index, formerly known as the "Cheese Shop." Planet Python is a comprehensive aggregator of Python blogs. There are many Python related email lists you can join, including the tutor list for newbies. The Active State Python Cookbook contains thousands of recipes. Not to be confused with a dead tree cookbook. Looking at well written Python code is a great way to learn Python. Think you're smart? Some people claim you can learn Python in 10 minutes. The Python Community maintains several Internet Relay Chat (IRC) channels. Here's some IRC help. The Python Community loves to have super-huge annual get-togethers. Learn Python is an interactive online set of Python tutorials. Dive Into Python, by Mark Pilgrim of Apex, was the greatest programming book ever written. Unfortunately, halfway through the book, all the examples were based on now-defunct web services. However, the new edition, Dive Into Python 3 doesn't suffer from that defect, even though it no longer employs the radically Pythonic way of teaching Python we loved in its predecessor. Python Learn is Dr. Chuck Severance's site for Python tutorials related to his Python For Informatics online course hosted by the University of Michigan's School of Information. Think Python was formerly known as "How To Think Like A Computer Scientist" and was several years in the making. How To Think Like A Computer Scientist is still available, though, and has been translated into many languages and has also been revised into a new Python 3 edition. A Byte of Python is available in both Python 2 and Python 3 versions and is being translated into many languages. Invent Your Own Computer Games With Python is a free online book. Data Structures and Algorithms with Object-Oriented Design Patterns in Python is an essential and monumental tome of computer science. Software Carpentry is an introduction to the art of software engineering using Python. Titus Brown has been working on Advanced Software Carpentry. Dave's Page is a compendium of several Python texts including Dave Kuhlman's comprehensive "A Python Book." The Art and Craft of Programming, Python Edition is recommended by MIT. Python For Beginners is a set of frequently updated online tutorials. 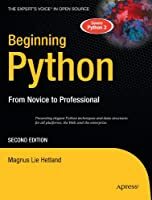 Python Books is another list of online Python books. PyVideo.org is now the official repository for Python conference talk videos. Presentation slides for the most recent Pycon may often be found on Speakerdeck. or here. Show Me Do is a place for Python video tutorials. Python is the teaching language at MIT. They put their Introduction to Computer Science course online as video. Bucky lives in Raleigh and has 43 Python Tutorials (Windows-centric) on YouTube (along with WxPython and Blender tutorials). Some of Alex Martelli's Python talks at Google are available as video. Some of David Beazley's courses on Python concurrency are available as video. The Python Papers an an annual collection of high-minded monographs about Python. Or the journal of Kiwi PyCon. Or both. Python Weekly is a marketing campaign which looks to be put together by a bot scraping various Python feeds. Some interesting links, nonetheless. The author of Python for Dummies shows you how to use threading in Python (but only if you have to). Today there are much more sophisticated approaches to concurrency in Python than simple threading. Be sure not to miss David Beazley's Curious Course on Coroutines and Concurrency (Video: Part 1, Part 2, Part 3). A child's garden of Python Quick References might be just what you need. Python Infrequently Answered Questions has answers for... infrequently answered questions about Python, including the the most elegant matrix transposition solution of any language ever. Doug Hellman, former chief editor of Python Magazine, will send you his Python Module of the Week. David Mertz wrote a series of indispensable columns for IBM Developerworks called Charming Python as well as a fantastic free online book called Text Processing in Python. David Goodger, past Secretary of the Python Software Foundation, can show you how to Code Like a Pythonista. most of which you can find on YouTube. Python 411 has a list of hundreds of Python tutorials, book reviews, podcasts, and screencasts. The O'Reilly Python Devcenter has a few articles to note. The Python Enterprise Application Kit (PEAK) was an important source of information about Python eggs, setuptools, and easy_install. Now the Python community is more about distribute and pip. Learn about Python and CGI from UVA or the BDFL. For people who have never programmed before. The Head First series is recognized for ease of use. Third edition coming out in November 2013.